WP EasyCart offers a comprehensive membership content system that allows users to purchase subscriptions and then access content you provide to them. This is great for distributing custom content such as videos, music, downloads, pdf’s, e-books, and other content only to those who have a subscription or membership. The best part about the WP EasyCart membership system is that you can build custom content pages using your own page builders and lock those pages down easily with a few clicks. The first step is to sell your product as a membership or subscription. You can offer a regular product as well, but most will sell a membership so users must have an account and a purchase in order to access content. To build a subscription, simply refer to this section in the product development page. Click Here to Build Subscription Products. The next step is to offer unique material or content to your users. This is as simple as creating a new wordpress page and securing its contents. 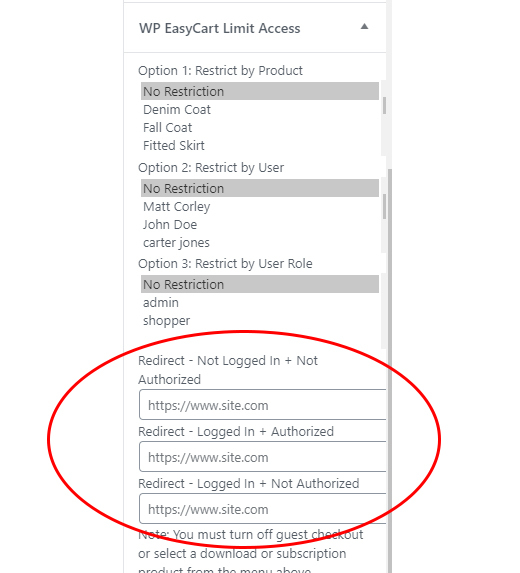 Look for the sidebar from WP EasyCart that allows you 3 options to restrict the page by. Option 1: Restrict by Product – Simply select all of the products you wish to restrict by, and a customer must have a past purchase of those in their order history in order to view content. Option 2: Restrict by User – This allows you to build custom content for a few customers and multi-select which users have access to the content. Option 3: Restrict by User Role – And this lets you use our user role system and those customers will have access to the content. To learn more about User Roles – Click Here. Redirect URL – This allows you to setup a variety of redirects based on your particular needs. Some examples below of what you can redirect based on the user viewing this particular page. Remember, this is the secure member page, so access to it is based on Option 1, Option 2, and Option 3 settings. Redirects are optional and help you send users to specific points based on their login status and membership status. Not Logged In + Not Authorized -> Send user to a purchase page or login page. Logged In + Authorized -> User should be able to access this page, perhaps leave this empty so they see this page. Logged In + Not Authorized -> Send user to an upsell page to buy access to this page.